In different places and times, much of the world has chosen Saint George as a Patron Saint. His slaying of the dragon as a symbol of the victory of goodness over evil endeared him to many. 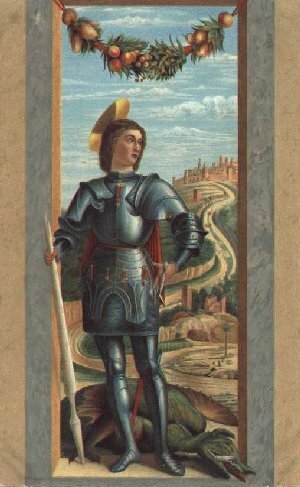 Scout in the role of Saint George. Of hiking, and jolly good camping as well. There is almost nothing known of the early years of Saint George's life. He was born sometime in the year 263AD, in the city of Lydia near Jerusalem. His parents were from Cappadonia, a city in present day Turkey. Is is said that his father was an Arab Sheit. Sometime in his seventeenth year, he enlisted as a calvary soldier in the army of the Roman Emperor Diocletian. He became a high ranking officer, rising through the ranks because he was a proficient soldier, an able horseman and had a commanding and cheerful attitude. When the Emperor Diocletian began his campaign of persecuting Christians, George, who was a devout Christian, requested an audience with the Emperor and was granted one. George at this conference pleaded with the Emperor to refrain from this distasteful practice. Diocletian was so annoyed and incensed, that he commanded George to recant his religion. When he refused, George was arrested, tortured, and finally put to death on April 23, 303AD. This day is now known as Saint George's Day. Ancient storytellers told legends of an Eastern city called Salem where a terrifying dragon lived in a swamp nearby. The dragon demanded a daily tribute of sheep and cattle. Soon, after exhausting these food supplies, the dragon demanded the sacrifice of two children a day. A lottery system was devised to pick the victims. Cleodolinda, the daughter of the King, was chosen for that day's sacrifice. As Cleodolinda was sadly proceeding to her doom, along came the knight George. Seeing the dragon about to gulp down the lovely princess, George promised the citizens deliverance from their troubles. After making the sign of the cross, he transfixed the dragon with his lance and wounded it with his magic sword Ascalon. George then had the princess bind the beast with her girdle. The dragon then became docile and tame, and followed the princess and George back to the city. There in the market square, George killed the dragon with his lance. As George was killing the dragon, he told the city citizens that this act was to show the power of God. Not only was the princess saved and the city relieved, but the people gave up their idols and accepted Christianity. George was said to have married the princess and lived happily ever after. George was canonized by Pope Gelasius in 494AD. The Pope said St. George was one of those "...whose names are justly reverenced among men, but whose acts are known only to God." St. George exemplified courage, devotion, piety, leadership, truthfulness and dedication. Crusaders venerated him and wore his cross (red on a white background). King Edward III of England chose George to be the patron Saint for the Knight of the Garter. During this time he also became the patron Saint of Portugal and Italy. Czarina Catherine II founded the Russian Order of Saint George. If you think of this tale as an allegory rather than a legend; with Saint George representing Christianity and the dragon as paganism, this shows us how good triumphs over evil. Baden-Powell often used this as a symbol in the character building program of Scouting. The Rover program started in 1917 is based on a Knighthood theme, with the symbol of St. George, patron saint of Scouts, being important. St. George is typical of what a Scout should be. He epitomized the qualities of selflessness and both moral and physical courage which Baden-Powell saw as being among the aims of Scouting.